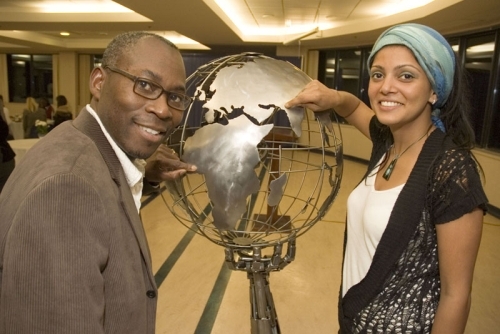 Chris Ellom, with the organization Smile Africa, and Bhavana Kapal, a third-year social work student at UBC Okanagan, point to their hometowns – Accra, Ghana, and New Delhi, India -- on a metal sculpture presented to UBC Monday night by Vernon artist Cory Fuhr. Cory Fuhr is an artist with a vision for the world – literally. One of the Vernon artist's latest works, symbolizing the concept of global citizenship, is a meticulously fashioned metal sculpture of the Earth supported by a massive metal arm of fused machine parts. At the Earth's core is a small cluster of metal gears with special symbolism. "Working on it, I felt the Earth is a living object, so I put a heart in it," Fuhr said Monday evening when he presented the sculpture to UBC Okanagan in commemoration of Global Citizen Week, Feb. 9 to 16. UBC Okanagan's International Week, first celebrated in 2006, is part of an expanded Global Citizen Week in Kelowna this year. Several local organizations have joined together to raise awareness of the world's social, political, economic and environmental issues, building on the success of Global Citizen Week first developed by local volunteers in 2004. "We're living in a time with huge impacts and challenges in the very near future," said Fuhr. "For me, a global citizen is about responsibility and looking after each other. Hopefully, we can all work together to overcome the challenges that we face." During Global Citizen Week, a variety of public events have been hosted by community organizations presenting information about the United Nations' Millennium Development Goals, a Global Citizen Forum to help local organizations network with one another, a special forum on gender equality and community development, and a multicultural food and entertainment festival. Participants included the Intercultural Society of the Central Okanagan, Kelowna Community Resources Host Program, the Victoria International Development Education Association (VIDEA), and numerous other organizations. Events continue this week at the UBC Okanagan campus. Highlights include a presentation on Kelowna Ogopogo Rotary International Endeavours at 12:30 p.m. today (Wednesday, Feb. 14) in the Arts Building ART 115.